This article is about 9-Volt, a character in the WarioWare series. For other uses, see Volt. 9-Volt, as he appears in WarioWare Gold. —9-Volt, WarioWare, Inc.: Mega Microgame$! 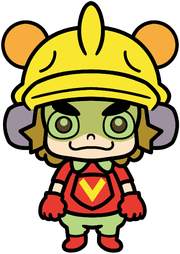 9-Volt is a major human character in the WarioWare series. He is a Nintendo fan, he collects everything about this company, and loves to play video games. 9-Volt lives with his mother, 5-Volt, and his pet Fronk in their house in Diamond City and attends Diamond City Elementary. He debuts in WarioWare, Inc.: Mega Microgame$! as one of Wario's friends who helps him produce microgames. Since WarioWare: Twisted!, 9-Volt always stars together with 18-Volt in the WarioWare series, who becomes one of his best friends in this game. 3.1.2 Profile information from WarioWare, Inc.: Mega Party Game$! 3.1.3 Website bio from WarioWare: Touched! Firstly, 9-Volt could be seen in the intro of WarioWare, Inc.: Mega Microgame$!, where he is called by Wario to join his "company" WarioWare, Inc. and to produce microgames for his upcoming game. Like Wario's other friends in Diamond City, 9-Volt agrees. 9-Volt, at home with his Nintendo collection and mixing console. In 9-Volt's own story, the school is out and he skates home with his high-tech skateboard, SK8. At the house, 9-Volt gets into his room and plays with his mixing console. 9-Volt says "Hello" a few times and with the help of the machine he imitates the voice of Jimmy T. or at least a similar voice while saying it. 9-Volt's oversized Game Boy answers him with "OK". Then 9-Volt makes music with the mixing console and spins records on it. Some kind of grabber comes out of the Game Boy and pops an over-sized cartridge into it. Later, while 9-Volt still spins records, Ken the Reporter appears and announces that the Game Boy Advance SP is on sale in stores. Quickly, he leaves the house and his skateboard transforms into a hoverboard. With that, 9-Volt hurries to the next store to purchase the new handheld. 9-Volt also makes a short appearance in the ending story of the game, where Wario states to his employees in the WarioWare headquarters that they wouldn't get anything of the money he earns with the game he and his friends make and then he escapes. 9-Volt is in shock, but like the other employees except for Mona, he didn't chase after Wario. 9-Volt is featured in four unlockable minigames in WarioWare, Inc.: Mega Microgame$!. In Skating Board, he appears as the protagonist of the game and has to avoid obstacles and red birds with his skateboard. In the two-player minigame VS Chicken Race, 9-Volt is the character of the player who has to use , while the other player's character is a Fronk, possibly his pet. 9-Volt also makes an appearance in the minigame taken from Mario Paint, Fly Swatter, where the Spiny appearing in the congratulations sequence has been replaced by him. The minigame Paper Plane features 9-Volt as one of the characters looking through a window and telling the current flight time. In WarioWare, Inc.: Mega Party Game$!, 9-Volt hosts a television show called Super Show. There, he uses a mixing console again and a Game Boy Advance with arms and legs that states "OK" in a similar way to the Game Boy in the prior game. After 9-Volt's entrance, Kat and Ana followed. 9-Volt is one of the ten selectable characters in the multiplayer games. 9-Volt greets 18-Volt, and invites him over to his house. In the intro of WarioWare: Twisted!, 9-Volt comes along with Mona to Dr. Crygor's Lab. There, Dr. Crygor tries to fix Wario's broken Game Boy Advance with his invention, the Gravitator. But it has no buttons anymore after the repairing, instead of that the player has to move the system to move the character in the game. 9-Volt and Mona try it out and enjoy it. Wario gets the idea to make a new WarioWare game involving this style of gameplay. 9-Volt is shown to be a troublemaker at school in this game. In his own story, a new student named 18-Volt came into his class. On his first day at Diamond City Elementary, the teacher asks 18-Volt what his hobby is, to which he responds by taking out his boom box and playing loud Rock 'n Roll music. 18-Volt got in trouble for this and after school he heads for his house broken-hearted. However, 9-Volt stops him and states that he enjoys his music. The two of them become fast friends and 9-Volt invites 18-Volt over to his house. When they got there, 18-Volt is ecstatic to see that 9-Volt has a Nintendo Entertainment System and the duo spends a lot of time on playing on the system. Eventually, his mother, 5-Volt tells 9-Volt to go to bed and 18-Volt to go back home. At night, when 9-Volt has to sleep, he furtively plays with his Game Boy Advance SP under the bedspread, but 5-Volt catches him in the act and tells him to put it away. In WarioWare: Touched!, 9-Volt and 18-Volt go to the Toy Express to get a copy of the coveted, new Nintendo GameCube game, 36-Volt Man. 9-Volt snatches one and shows it happily to 18-Volt, who is carrying his boom box on his shoulder. Curious about their new game, the two friends quickly return to 9-Volt's House, in which he uses his SK8 to reach it. On their way, they pass the alien Orbulon who is running after his flying spaceship. At the house, 9-Volt and 18-Volt play far into the night and reign victorious in the game. To celebrate their success, 9-Volt spins records again, with 18-Volt dancing behind him and his Nintendo consoles in front of him. 9-Volt's mixing console features moving Mario and Luigi figurines, but it got so late that the two gamers fall asleep. In the morning, when they wake up, it's already 9 o' clock. 9-Volt and 18-Volt are shocked about the fact that they're late and rush to school. 9-Volt, showing his Game & Watch to 18-Volt. 9-Volt is visited by 18-Volt again in WarioWare: Smooth Moves. There, he showed a Game & Watch handheld console to his tall friend and plays with it. 18-Volt mistakes it for a Nintendo DS Lite at first. He wants to see more of the console and gropes it, but 9-Volt still has the console in his hands and informs him that he is still playing, but he couldn't wait and the Game & Watch breaks in two halves. He gets furious and commands 18-Volt to get out of his house. Now, 18-Volt has a bad conscience and tries to find a new Game & Watch for his friend. He first looks in Toy Express, but they didn't have what he desires. After leaving the store, 18-Volt notices another store where some gamers lineup. He got into the store and the owner of the shop, Shop Manager Iwata, coincidentally has the searched Game & Watch on offer. 18-Volt reaches for it, but surprisingly 9-Volt does the same. The friends face each other and they both excuse each other for their mistakes. 9-Volt tells 18-Volt that he wants to always be his P2 (Player 2) and all goes well after that. 9-Volt, starring in his own game, Super 9-Volt. 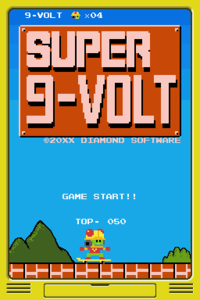 In WarioWare: D.I.Y., a game called Super 9-Volt shows up in 9-Volt's stage. It's a spoof of Super Mario Bros. and stars 9-Volt rather than Mario. 9-Volt, skateboarding, hits a Question Block shaped like a Famicom cartridge every time a microgame is won. 9-Volt, along with Mona, Jimmy T., Orbulon, and Ashley apparently left WarioWare, Inc. to work for Diamond Software in this game. Although, the reason they switch companies is unknown, various residents of Diamond City consider possibilities in the D.I.Y. Forums feature of the game. 18-Volt, who continues working for Wario, appears to view 9-Volt as a rival after his departure, as suggested by his role as a boss in his game (as well as their interaction after the boss game is completed) and his greeting to the player where he insists that he works at "twice the power as that other guy you might be thinking of". 9-Volt appears in the Wii U game, Game & Wario. He hosts the minigame "Gamer", that stars him with his Game Boy Micro-like console, playing microgames. As he was supposed to sleep, his mother often drops by his bedroom. If 5-Volt finds out 9-Volt is playing video-games during his bedtime, he is scolded by her and the player loses. On his minigame's title screen, 9-Volt is depicted as having red hair; this is also the first time he is seen without his helmet. 9-Volt is also in the Bowling minigame, depicted on a bowling pin like most other characters in the game. As with the other WarioWare characters, 9-Volt makes an appearance in Miiverse Sketch Masterpiece Collection, a series of video showcasing pictures of often questionable quality made in the game's Miiverse Sketch mode. 9-Volt is the host of the fourteenth video, themed after drawings of Samus Aran. 9-Volt makes a reappearance in WarioWare Gold for Nintendo 3DS. He, like the other characters, has a changed appearance, namely that he has grown a bit, has had his boxing gloves changed back to fingered ones, and has more hair. He is also seen attending a school. In his story, 9-Volt appears to find math uninteresting, but suddenly, Fronk appears despite not allowing pets in school to help 9-Volt make math fun by connecting them to video games. 9-Volt also makes a cameo appearance as a DJ in 18-Volt's opening as well as 5-Volt's ending cutscene. 9-Volt also appears in the Potluck Gang set of the Ultra League, where he goes on a camping trip with Orbulon, 18-Volt, Ashley and Red, Dribble and Spitz, Mike and 5-Volt. He asks the group what food they brought, saying that a potluck might have been a bad idea after Ashley brings a mandrake root. He is then seen playing cards with the rest of the group. Fronk will sometimes come to the door and look at 9-Volt playing. The TV will be lifted randomly by either Mr. Sparkles or 5-Volt. 9-Volt has two stickers that can be equipped in Super Smash Bros. Brawl's Adventure mode; one increases electric attacks by eight, and the other increases head attacks by five. Additionally, one of the names that can be gotten from pressing the "RANDOM NAME" button is "9VOLT". 9-Volt from Game & Wario is depicted along with his mother, 5-Volt, as a WarioWare series trophy in Super Smash Bros. for Wii U. The trophy can be purchased from the Trophy Shop. 9-Volt appears alongside 18-Volt as an Ace-class support spirit in Super Smash Bros. Ultimate. When equipped on a fighter, it grants immunity to electric floors. In World of Light, the spirit is located on the Base sub-map of the Light Realm. In the corresponding battle, the player faces against Villager and Incineroar on the Gamer stage. 9 Volt's appearance in the Wario... Where? set. 9-Volt makes an appearance in the Wario... Where? challenge set of Rhythm Heaven Megamix. The set's version of Super Samurai Slice features 9-Volt piggybacking a katana-wielding 18-Volt, as the later fends off assaults by demonic spirits in order to rescue Sal Out. 9-Volt along with 18-Volt makes a cameo as a background sign in Paper Airplane Chase, appearing after the player reaches 120 points in Endless Mode. His appearance is based on his WarioWare: Smooth Moves design. 9-Volt comes with his own set of microgames in all games of the WarioWare series. Between WarioWare: Twisted! and WarioWare: D.I.Y., the games are always provided by both him and 18-Volt. However, it isn't known how much he shares in the creation of the games. For example, in WarioWare: Touched! 9-Volt says "our games", but in WarioWare: Twisted! he just speaks about "my games" in the character select menu, plus 18-Volt isn't even mentioned by name in the menu. For WarioWare, Inc.: Mega Microgame$!, 9-Volt creates microgames of the Nintendo Classics genre. The games involve various Nintendo products from the 1960s up to the 1990s. WarioWare, Inc.: Mega Party Game$! also feature his Nintendo microgames, plus a multiplayer game made by him, Card-e Cards, which refers to a Nintendo product as well, in this case, the e-Reader. In WarioWare: Twisted!, the microgame set of 9-Volt and 18-Volt is called Spintendo Classics. As an exception all microgames are only based on Nintendo Entertainment System games in this game. While the microgames of most of the other developers involve a particular style of gameplay per developer, the microgames of him and him require all kinds of spin techniques. In WarioWare: Touched!, the name of 9-Volt and 18-Volt's set of microgames is Retro Action. The choice of Nintendo products is much more versatile than in the prior game again. Also newer products from the 21st century are featured. The microgames include all kinds of ways of using and also the application of the microphone, while most other microgame sets involve a particular technique again. In WarioWare: Smooth Moves, 9-Volt and 18-Volt's set of microgames involve nearly all possible forms. Considerably more microgames are based on more recent Nintendo products. An example is Brain Age, which is based on the Nintendo DS game Brain Age: Train Your Brain in Minutes a Day! In WarioWare: D.I.Y., 9-Volt returns to his original role by going solo, while his friend 18-Volt is granted with his own microgames in WarioWare: D.I.Y. Showcase. Despite this, their microgame stages are both Nintendo themed. Akin to WarioWare: Smooth Moves, 9-Volt's microgames adapt to more recent Nintendo products such as Wii Fit. In WarioWare Gold, 9-Volt, 18-Volt, and 5-Volt each have separate microgames, themed around Nintendo. 9-Volt's microgames are again named Nintendo Classics and are hosted in the Touch League. Some of them include, but are not limited to Hanafuda, amiibo, and the Wii's Mii Channel. Hey! My name is 9-Volt! I'm the grade-schooler gone old school! I've put together a collection of retro classics that'll make you late for class. Come on over and try a few out! I'll spin the tunes while you play the games! I think Nintendo games are the greatest, so you can imagine my surprise when I found that Wario lives in my... uh, I mean that I live in his city! Bio: This high-tech skater boy studies at Diamond Elementary. He is such a Nintendo fanboy that he owns every piece of Nintendo hardware and software ever made. Old-skool fanboy finds a soulmate in new classmate 18-Volt. Together, they serve up microgames inspired by classic Nintendo games. Rank C – 9-Volt lives for Nintendo. He's got all the games, from retro to the very latest. He's in elementary school. Rank B – DJ'ing is 9-Volt's most leveled-up skill. Though just a school kid, he DJ's at clubs and mixes in game tunes. Rank A – Skateboarding is 9-Volt's most leveled-up hobby. He loves going fast, even though he often drops Fronk. Wii U Game & Wario (06/2013) Wario and friends' newest selection of minigames are all designed to be played with the Wii U GamePad. In Gamer, you take on the role of young 9-Volt, playing a selection of microgames in bed at night. When his mom pops her head in, you'd better pretend to be asleep. If she catches you playing, it's game over! The newest selection of minigames in Game & Wario are all designed to be played with the Wii U GamePad. GAMER has you take on the role of young 9-Volt, playing a selection of microgames in bed at night. When his mum pops her head in, you'd better pretend to be asleep, because if she catches you playing, it's game over! For this subject's image gallery, see Gallery:9-Volt. "I think Nintendo games are the greatest, so you can imagine my surprise when I found that Wario lives in my... uh, I mean that I live in his city!!" - WarioWare, Inc.: Mega Microgame$! "I'm totally crazy over video games! I wish I got graded on my games instead of homework..." - WarioWare, Inc.: Mega Party Game$! "New games are cool, but they still don't rock as hard as old-school Nintendo games!" - WarioWare: Touched! "The wait is killin' me!" - WarioWare: Touched! "We rocked that game!" - WarioWare: Touched! 9-Volt's name comes from the operating voltage of the Nintendo Entertainment System. The 9-Volt and 18-Volt's sign in WarioWare: Touched! is a reference to Super Mario Bros.. In WarioWare: Twisted!, 9-Volt has played in a baseball game as heard on the radio and one of the songs of Dribble and Spitz. This page was last edited on April 19, 2019, at 15:00.